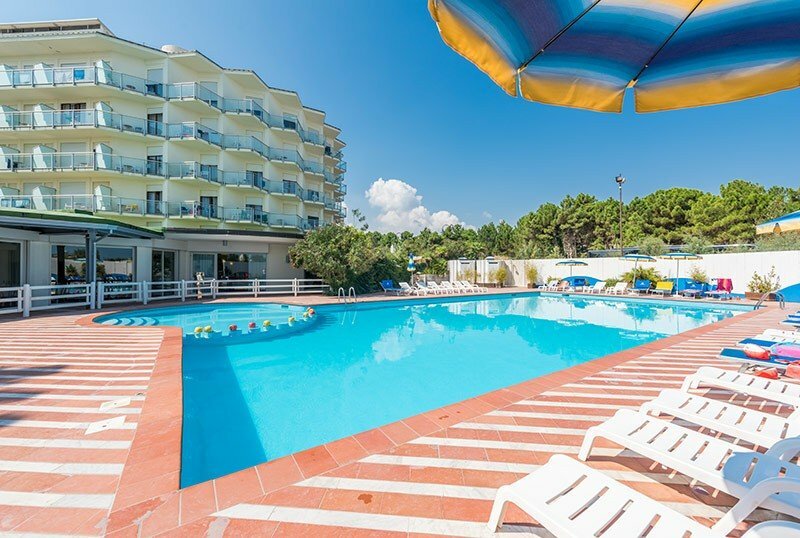 The Hotel Bellevue Beach , 4-star hotel in Milano Marittima on the sea, has a garden with swimming pool which leads directly to the private beach. Reserve for families many services including mini club, baby pool and playground area. It has parking, WI-FI, garden and accepts small pets. The hotel is located in Milano Marittima and has direct access to the private beach. The center can be reached on foot in about twenty minutes or, in the evening, with a discounted train for hotel guests. The rooms of Hotel Bellevue are all facing the sea and equipped with air conditioning, magnetic card opening system, satellite TV and digital terrestrial LCD, telephone, safe, WI-FI and private bathroom with shower and hairdryer. Breakfast in the room for a fee, minibar on request. COMFORT: located on the first floor, with a window facing the sea and a renovated bathroom. DE LUXE: on the first floor, with Jacuzzi and shower. EXECUTIVE: they are located on the intermediate floors, have a balcony facing the sea and a renovated bathroom with shower. EOLO: they are located on the upper floors, with a panoramic sea view and a renovated bathroom. FAMILY: composed of two connecting rooms with anteroom, a common bathroom with shower and two balconies. Large swimming pool with children's area and solarium with sun beds, garden, private beach with private access, open-air porch, terrace, TV sat, American bar, newspapers available, elevator. For an extra charge: laundry service, bike rental. PARKING: uncovered and free, with limited places. LUNCH AND DINNER: the cuisine, typically Romagna, offers a wide choice of first and second buffet accompanied by appetizers, vegetables, desserts, ice cream and confectionery of own production. VARIATIONS: vegetarian and vegan cuisine. In the hotel: children's pool, outdoor playground area, mini / junior club, live entertainment, bicycles with child seats available, strollers. For a fee: pediatrician and baby sitter. In the room: cots, cribs, safety rails, bottle warmers, baby baths. At meals: baby menu, baby food, high chairs, placemats to color, saucers and baby cutlery, flexible hours, "ristocucciolo" (base for baby food and fresh broths) and microwave available 24 hours a day, restaurant "La Sirenetta" where children can eat with the animators, goodnight buffet with milk, biscuits, herbal teas. On the beach: swimming pool, playground, entertainment, junior club, "Bimbo Lindo" corner with towels and changing table. The hotel has a large swimming pool located in the garden and surrounded by a sunbathing area with loungers. A part of the pool, with less depth, is separate and dedicated to children. From the garden, guests can directly access the hotel's private beach. Guests have at their disposal two private beaches, both equipped with a playground area for children, table tennis, table football, changing room, bar, entertainment, fitness, aquagym. Super Bimbi Free Offer! For stays of minimum 7 nights, from 31 May to 28 June, children up to 16 years are FREE in room with 2 adults. For stays of minimum 7 nights, from 31 May to 28 June, children up to 16 years are FREE in room with 2 adults. Call for more information or to request a personalized quote! Take advantage of the Easter holidays to spend a few days relaxing and having fun at the beach! Low Cost, 2 days for free and for children Free! Offer 7 = 5, every 7 days 2 are free! Free children in the room with parents! Large swimming pool of 220 square meters. with direct access to the private beach. On the sea - large swimming pool with solarium - private beach with direct access - free WI FI - free parking 7 = 6 One day FREE! 7 = 6 One day FREE! Private beach included: umbrella and comfortable sun beds. Free Wi-Fi in the room as in common areas. Happy Couple Offer: the second adult has a 50% discount!